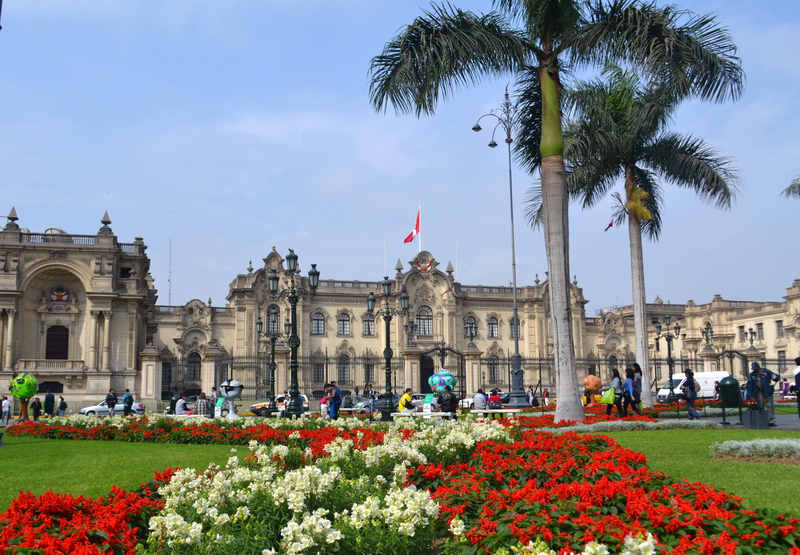 With almost 9 million inhabitants, Lima is Peru’s bustling megacapital. We stayed in the city just for a few days and blitzed right past it on our way back from Cusco and Machu Picchu but during the short stay it captivated me through its colorful squares and historic buildings (lovely both during the day and at night), its warm people and exotic food. 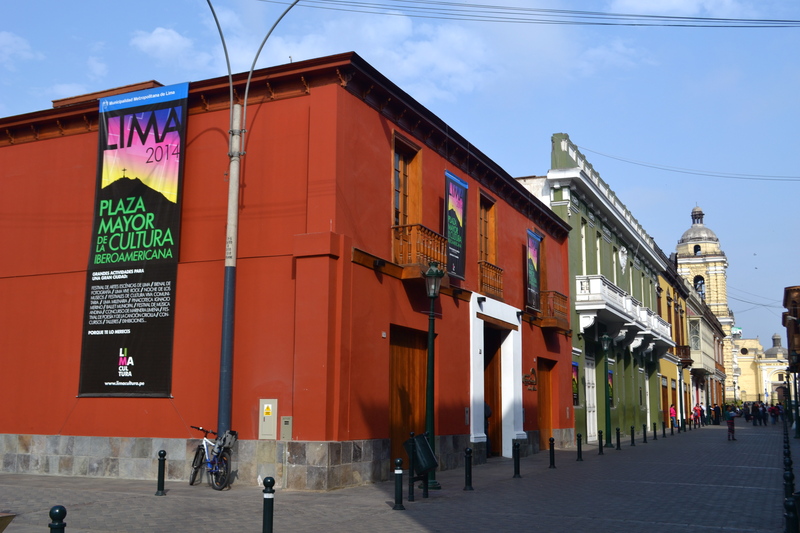 Lima’s urban section has a mind-boggling land area of 300 square miles but one should not worry as the city’s main attractions are clustered together on certain areas and they would just be walking distance or a short drive away from each other. As with other big cities, there are dangerous areas that a visitor must avoid. The very helpful and nice cab drivers warned us of the few places that tourists should not venture into especially streets in the city center. The following places that we visited were definitely safe and they were just beautiful. It was easy to fall in love with the city’s main square. On its four sides, are interesting monuments to behold. 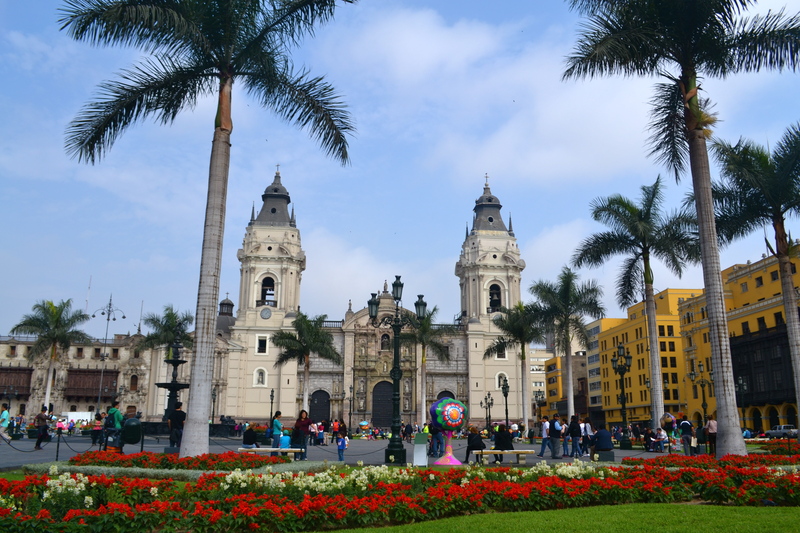 Also known as Plaza Mayor, Plaza de Armas is at the heart of the Historic Center of Lima, a UNESCO World Heritage Site. 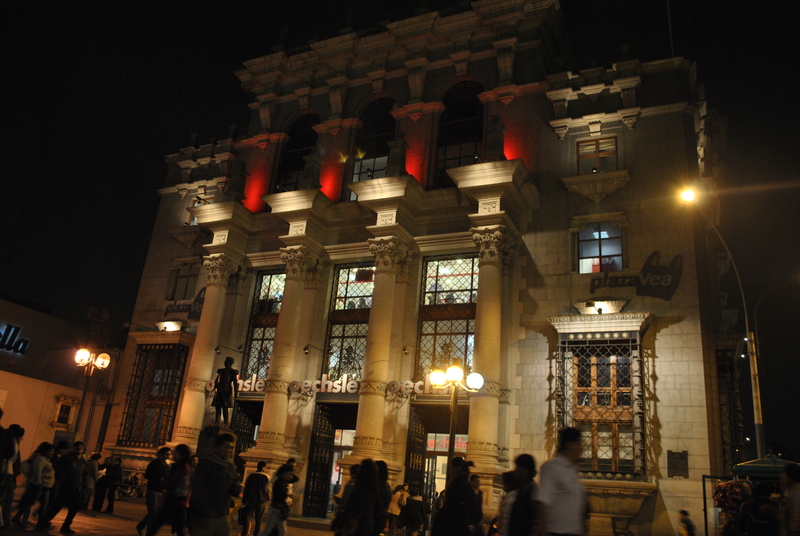 This was the only site in Lima where I took photos at both day and night. 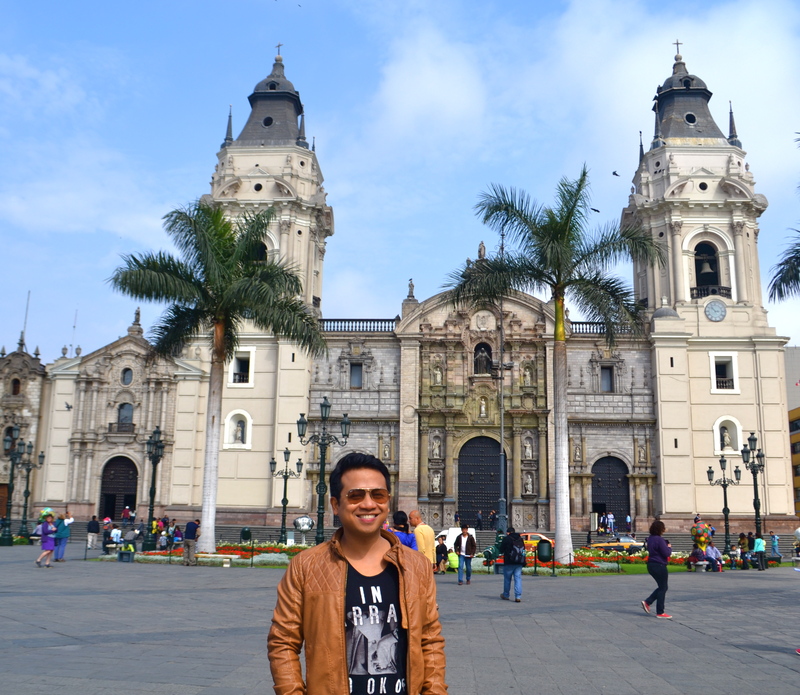 The Cathedral of Lima is an immense Roman Catholic baroque church on Plaza Armas’ east side. 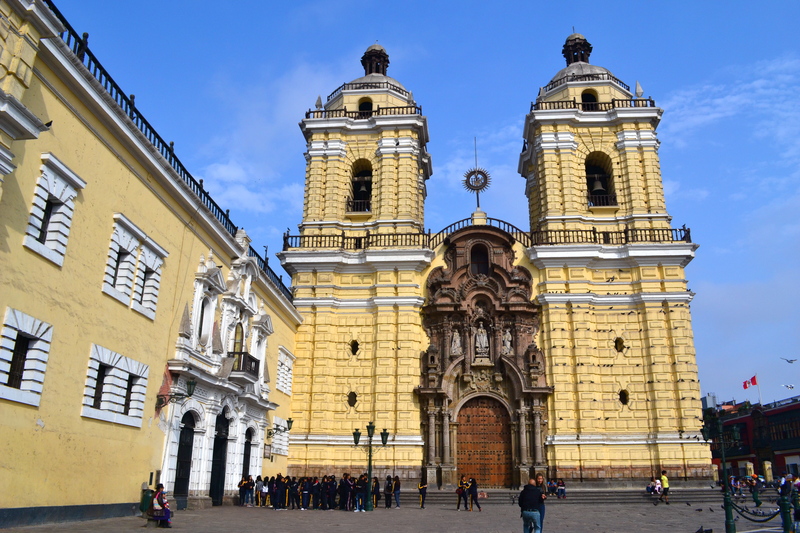 It was built in 1564 and it was designed by Francisco Pizzaro who conquered the Incas, founded Lima and whose tomb is inside the church. The church has undergone extensive repairs twice due to damages from earthquakes. 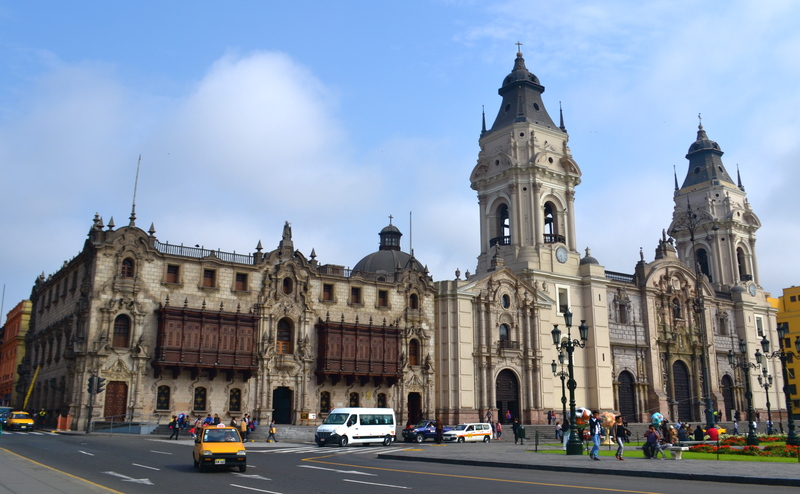 Adjacent to the cathedral to its left is the Archbishop’s Palace, the residence of the cardinal of Peru and the archbishop of Lima. Moving counterclockwise from the Archbishop’s Palace, to the north of Plaza Mayor is the Government Palace also known as House of Pizzaro. 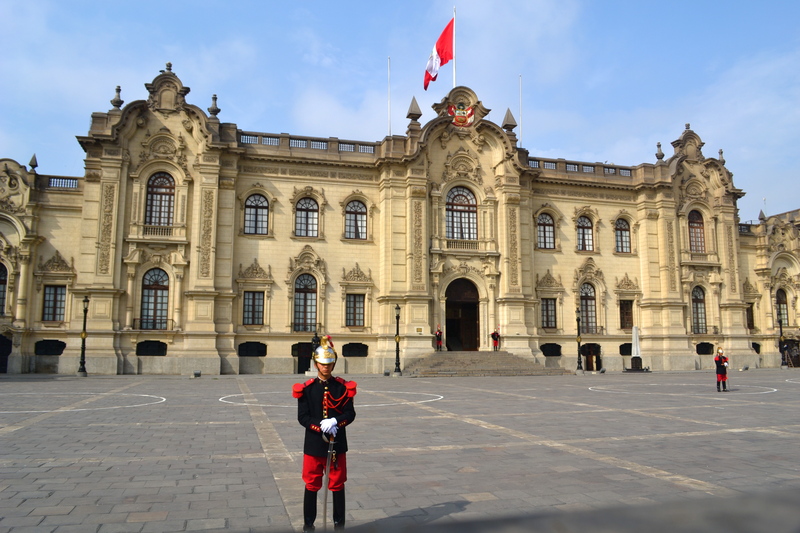 It was the house of the government headquarters when erected in 1535. It is recognizable by the large wrought iron fence that surrounds the building. 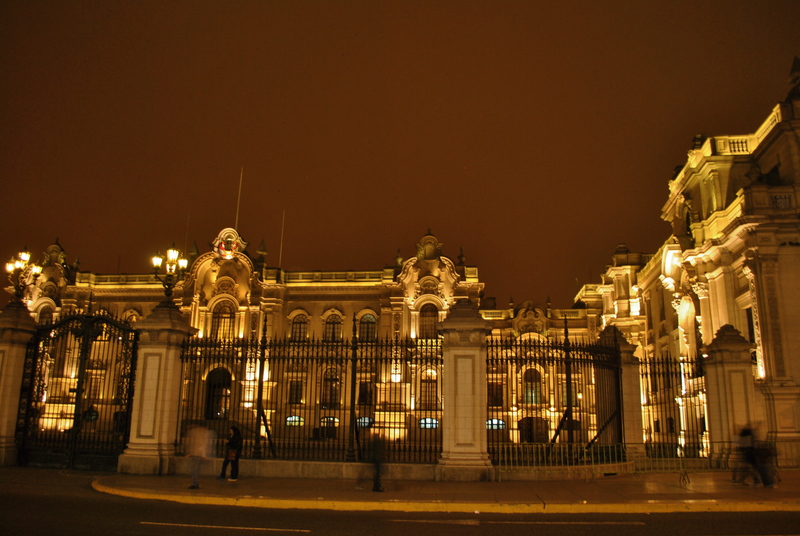 At night, the Government Palace is lit up to contribute to the dazzling display of lights around and inside Plaza Mayor. 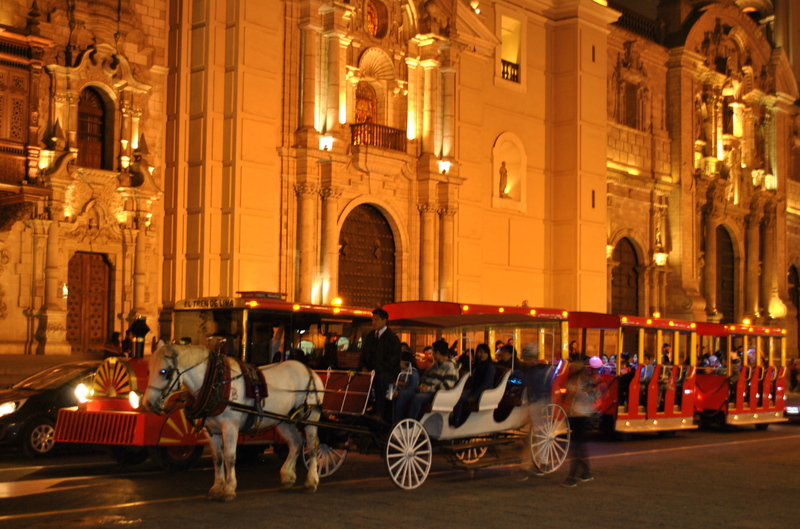 The whole plaza becomes magical at night with all the structures lighted up and with horse drawn carriages and open trains plying around the area. 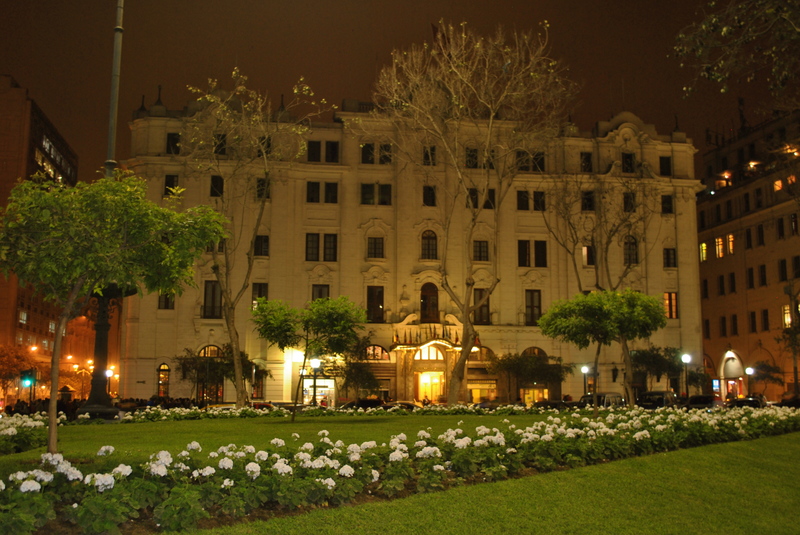 This is the Archbishop’s Palace at night. 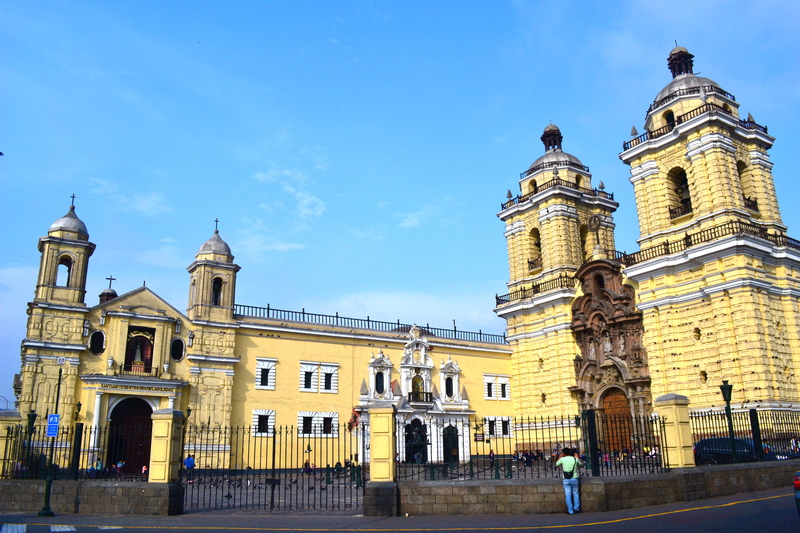 To the west and south of Plaza Mayor are the Municipal Palace and Palace of the Union. 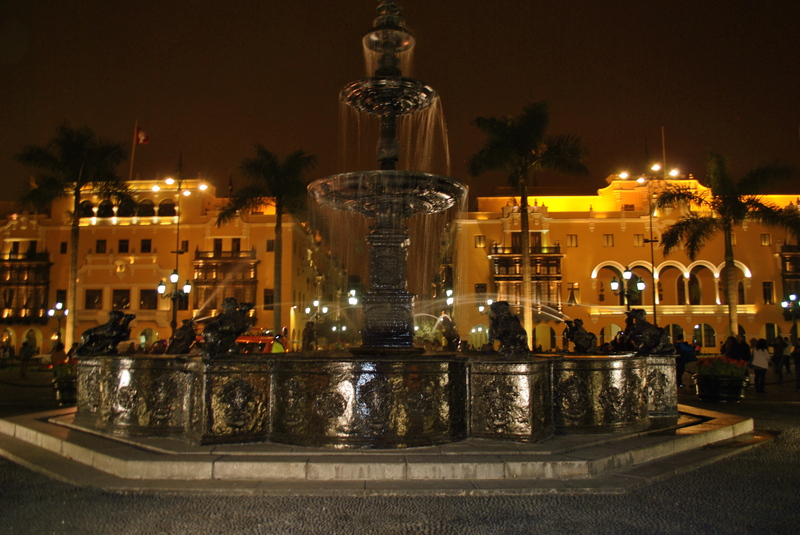 At the western side of the plaza in front of the Municipal Palace is the Fountain of Viceroy Garcia Sarmiento de Sotomayor Count of Salavatierra. 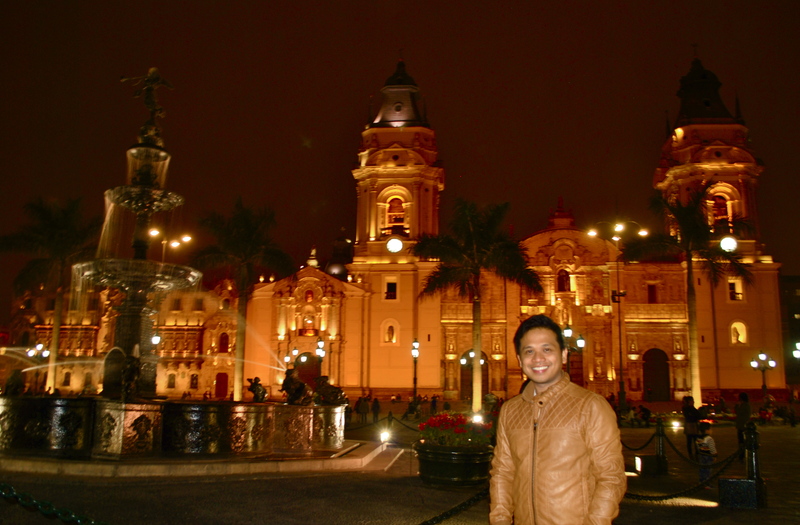 A night visit of Plaza Mayor is a must when in Lima. 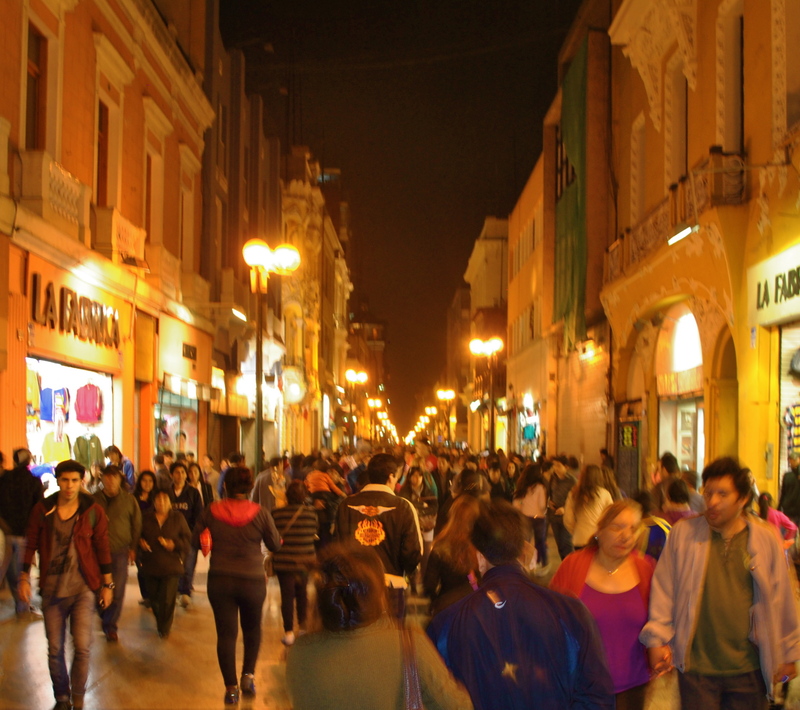 Although it has lost its aristocratic charm through the years, Jiron de la Union is still Downtown Lima’s most colorful and most important boulevard. 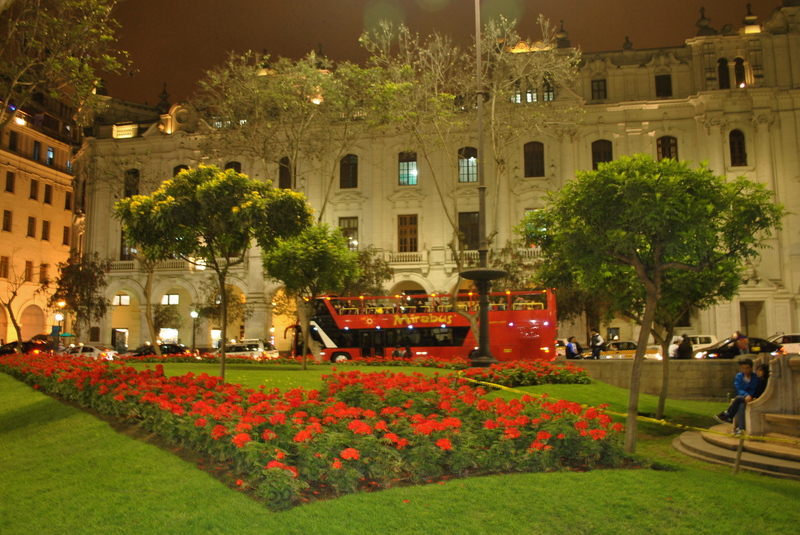 Located at the Historic Center of Lima it connects Plaza Mayor with Plaza San Martin. Boutiques and stores for window-shopping, restaurants and cafes for bar-hoppers line up at either side of the street and throngs of people stroll by the lively thoroughfare. Along Jiron de la Union are classic buildings that still retained their original functions like churches…..
…or those now serving for contemporary use like malls. 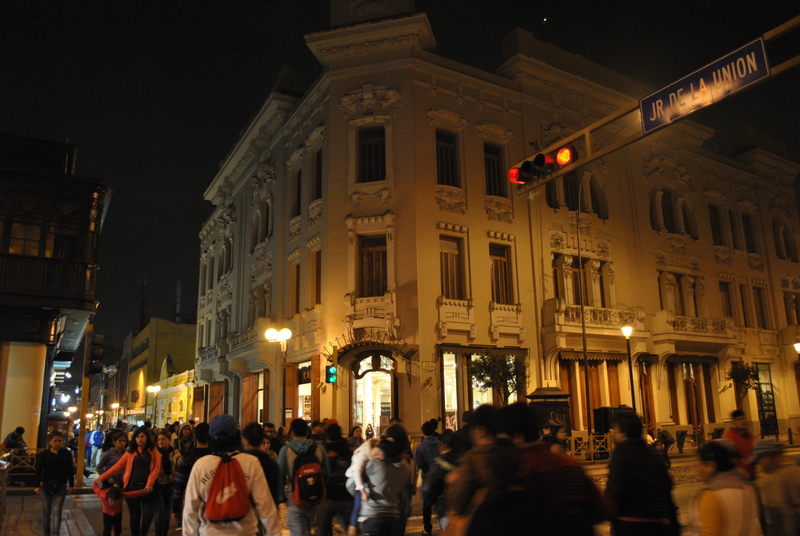 Walking southwest along Jiron de la Union from Plaza de Armas, one will reach Plaza San Martin. 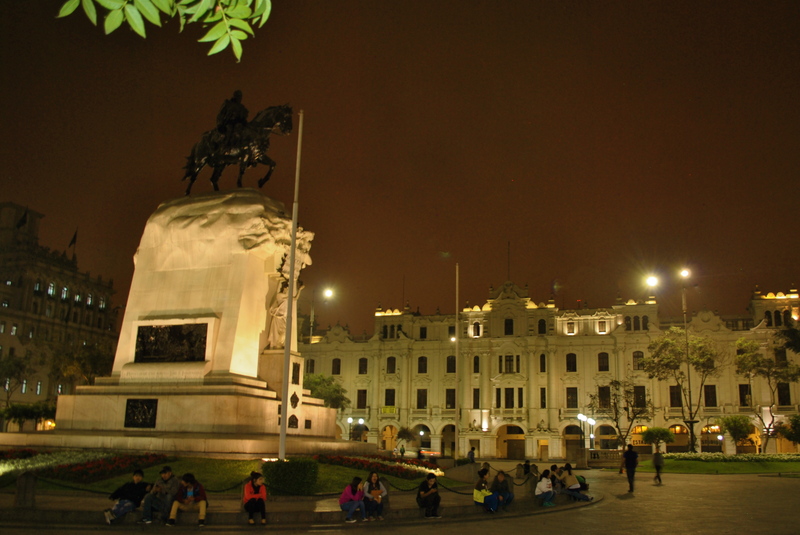 The monument at its center was built to give honor to Peru’s liberator, José de San Martín, an Argentine general and the prime leader of the southern part of South America’s successful struggle for independence from the Spanish Empire. 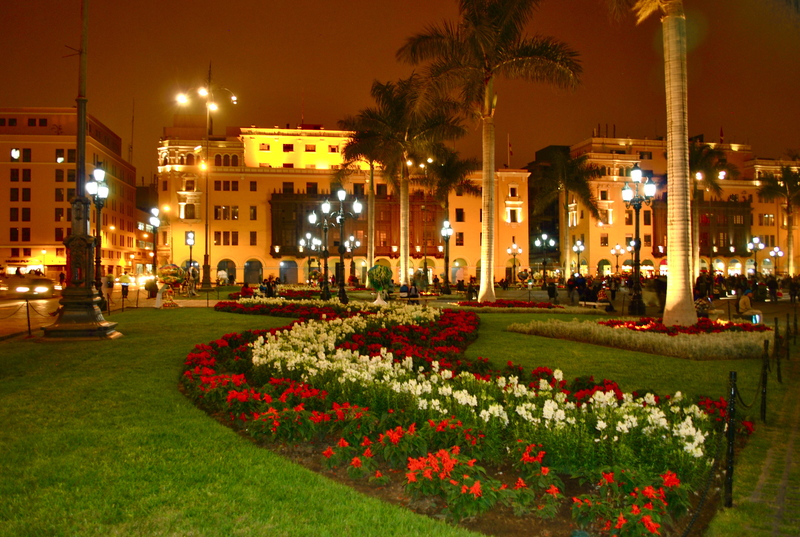 The Plaza San Martin is surrounded by well preserved Republican buildings influenced by the French architectural style typical in Lima at the beginning of the 20th century. 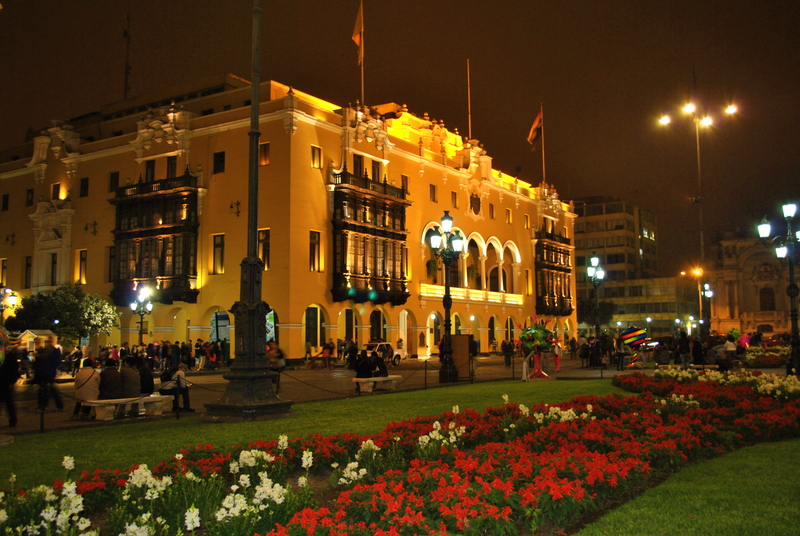 Just opposite the square you find the old, famous and most elegant hotel in Lima, the Gran Hotel Bolivar. 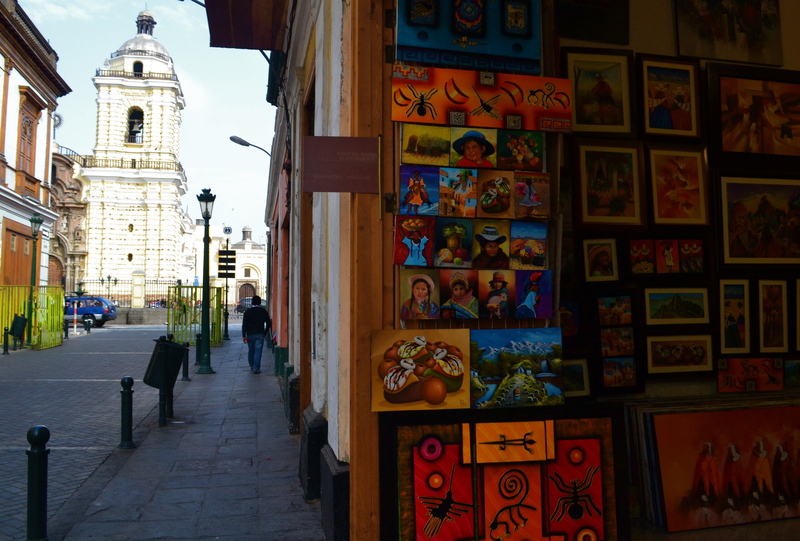 Around three blocks walk away from Plaza Mayor is Church of San Francisco. You will pass by colorful buildings and stores along the way. 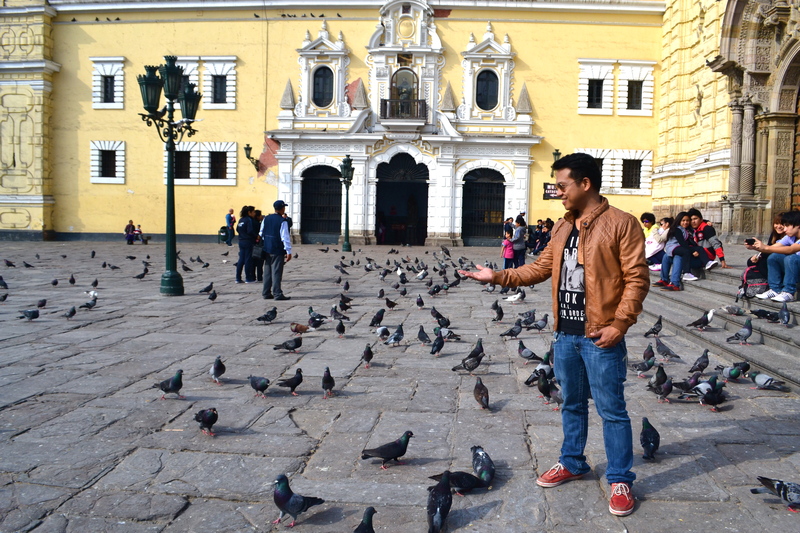 This is still part of the Historic Center of Lima. 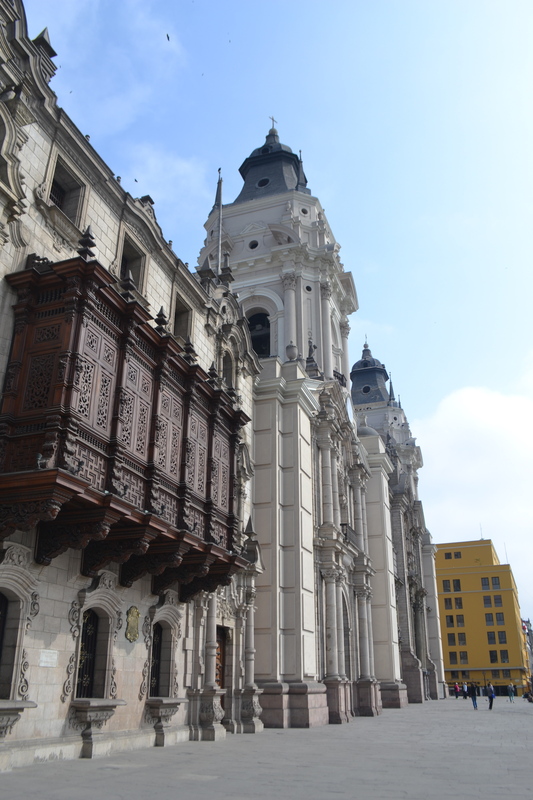 The Church of San Francisco is one of the best preserved colonial churches in Lima. Most people go to San Francisco, however, for its catacombs. 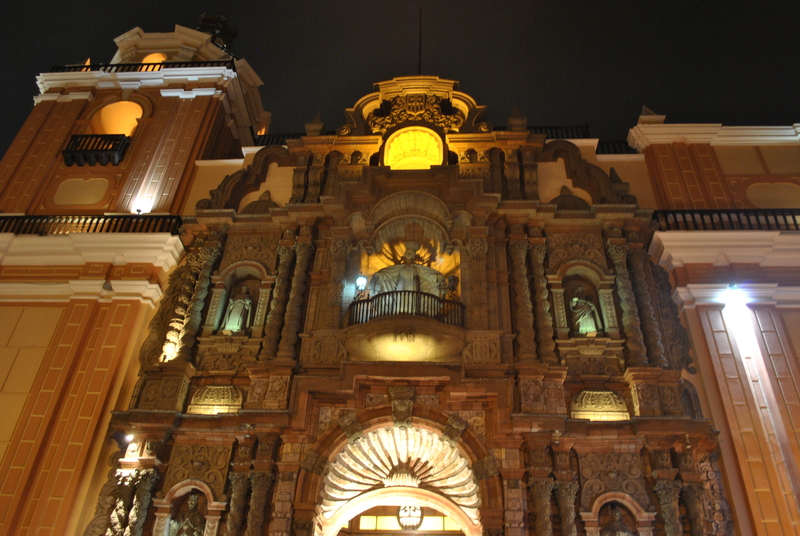 The catacombs were actually part of Lima’s original cemeteries, which were built under churches. Tour guides say an estimated 75,000 bodies are buried under San Francisco alone, and many of the remains are exposed, stacked in strange patterns in circular stone pits. A catacomb tour is not for the the claustrophobic so we did not do this tour. The church can be easily recognized with the swarm of pigeons on the patio out front. 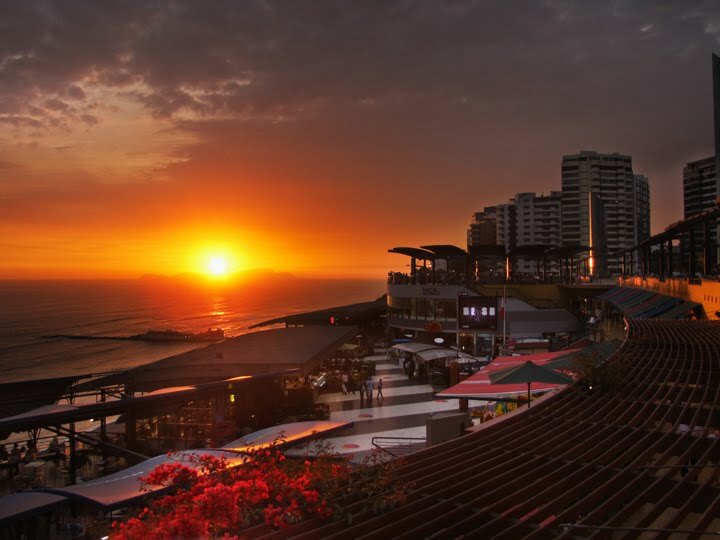 Along the seawalk in the Miraflores district is Larcomar, a multilevel, modern entertainment, food and shopping megacomplex that caters to most tastes. Larcomar cannot be easily seen as the entire complex is built into a cliffside, underneath Miraflores — the entrance across the street from the JW Marriott hotel; take the stairs down just before you get to the cliff’s edge. 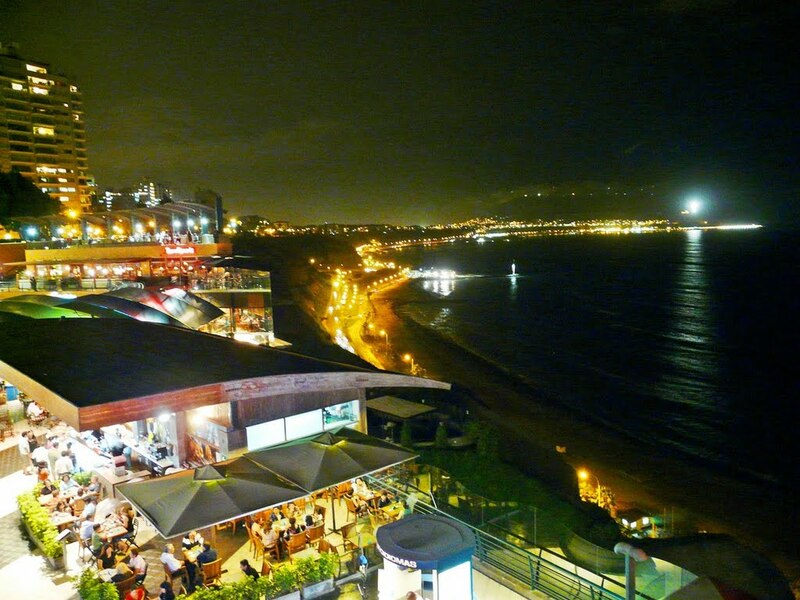 Larcomar has breathtaking ocean views, which you can enjoy from numerous restaurants offering Peruvian fare, as well as several American franchises serving everything from doughnuts to ribs. 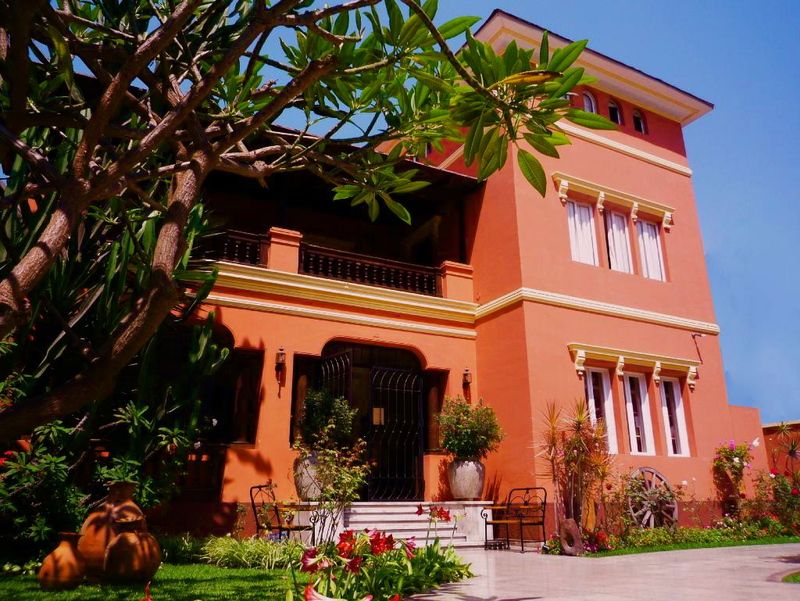 We chose Hotel Antigua Milaflores, a reasonably-priced, quaint and very charming inn in one of Lima’s nicest suburbs, Miraflores. 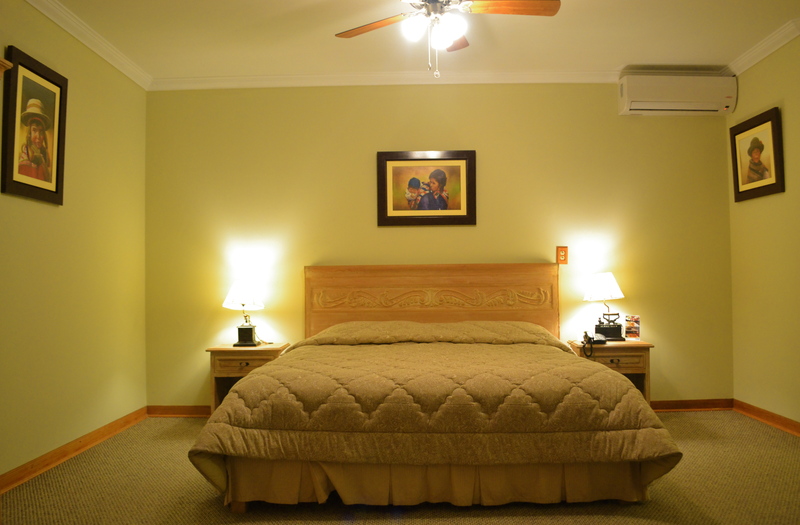 It is located near Lima’s best restaurants, vibrant nightlife, finest shopping, charming parks and beautiful oceanfront boardwalk. 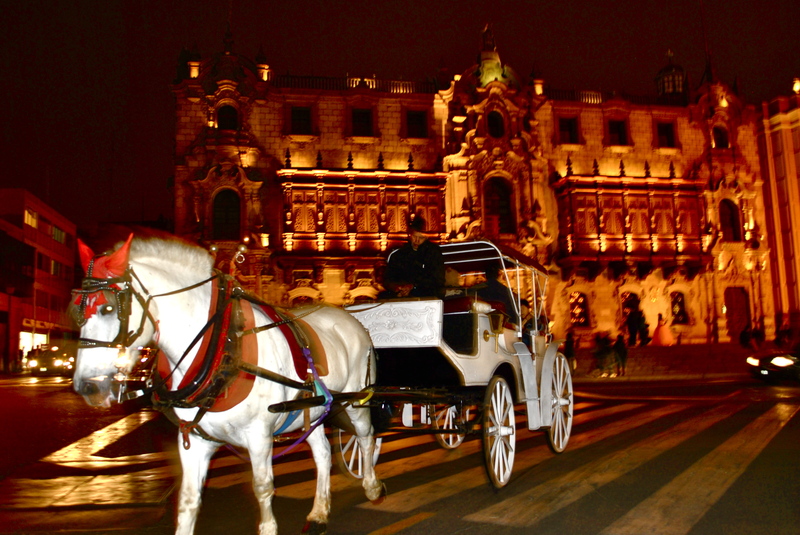 It is a short 25-min cab ride to the Historic Center of Lima. 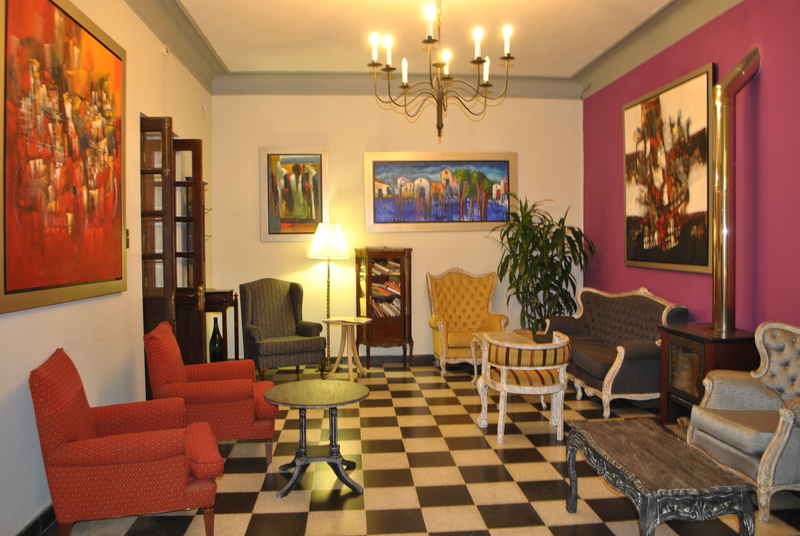 The tasteful decor of the hotel’s ground floor lobbies welcomes everyone into this elegant hotel. 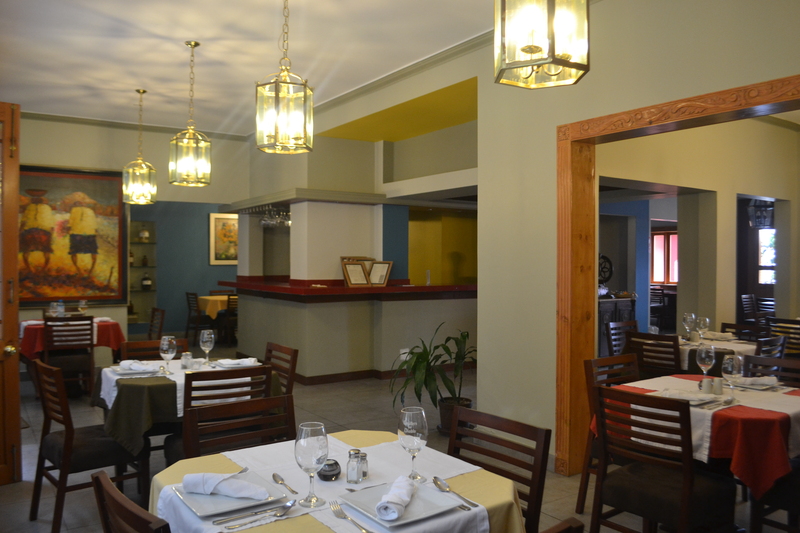 At the far end of the hotel is its own restaurant offering a great selection of beverages, breakfast options, Peruvian dishes, coffee and deserts. 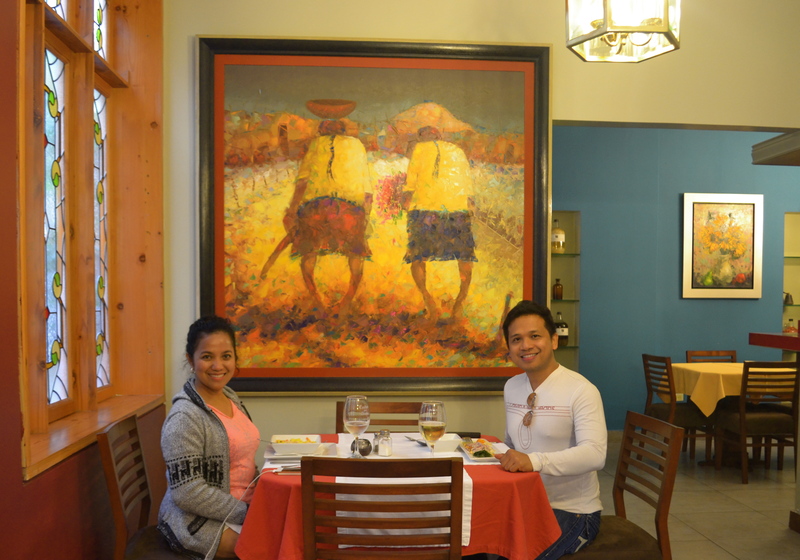 The restaurant is not a bad option if one does not feel dining outside the hotel anymore. 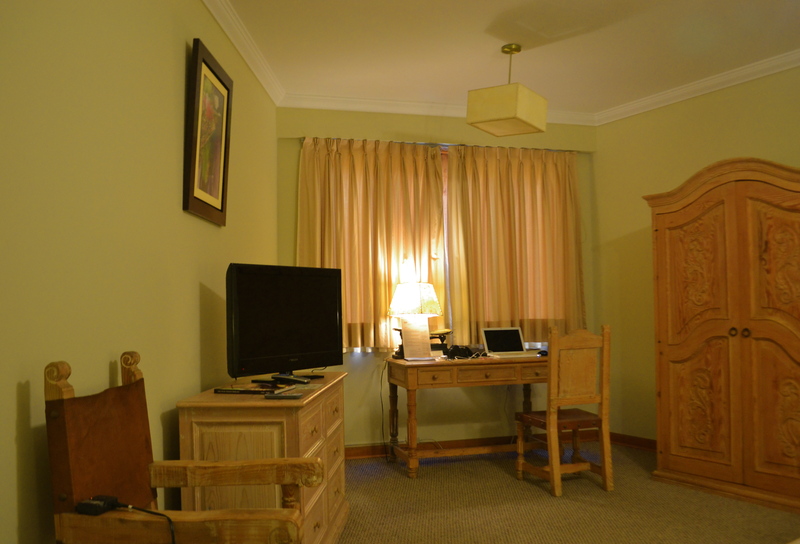 We were given a very spacious Colonial room with charming decor. 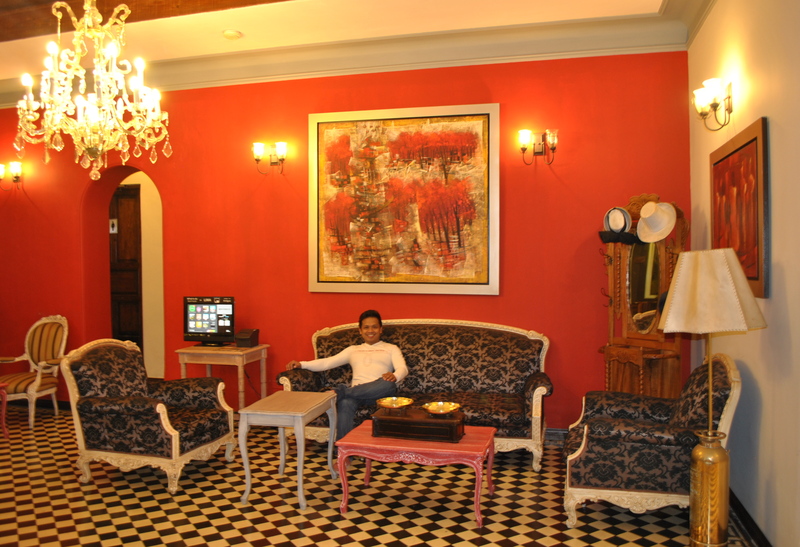 I loved the handcrafted wooden furniture and the free and very fast wifi. 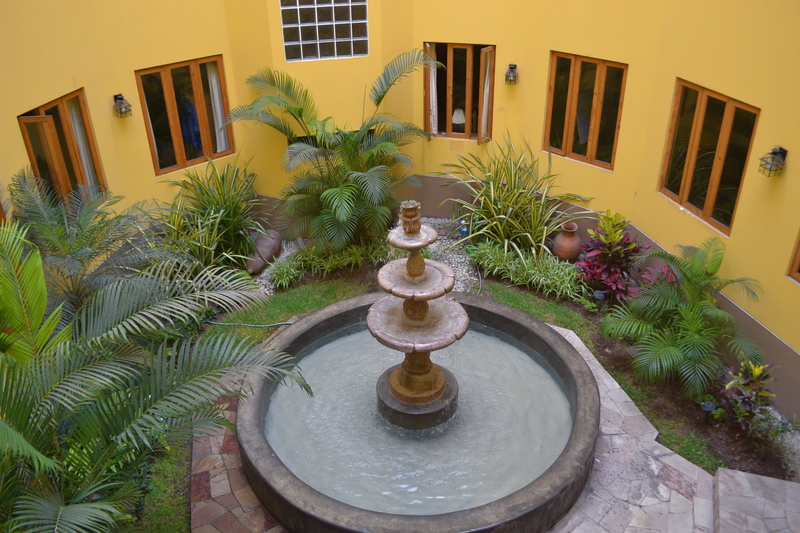 The view from our room was the fountain in the middle of a tiny garden. Staying at this hotel was a respite from the generic “glass and steel” hotel experience. 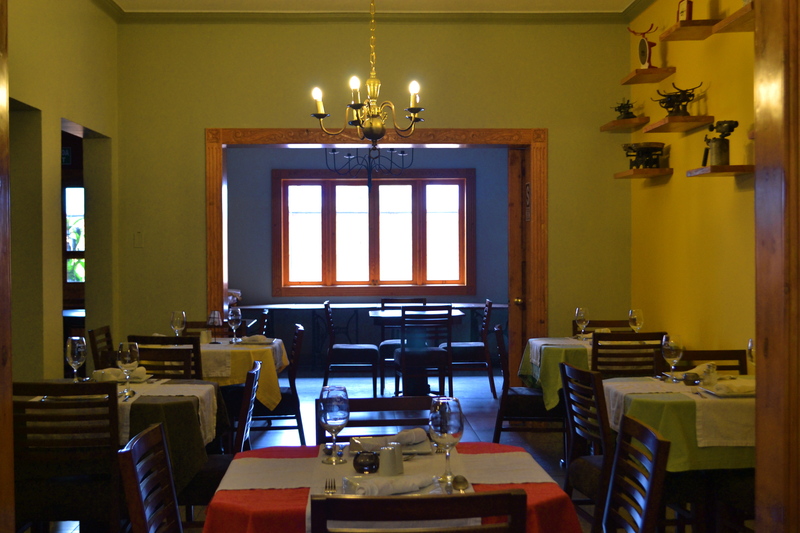 Recently, Lima has been riding a wave of growing fame for its gustatory pleasures. 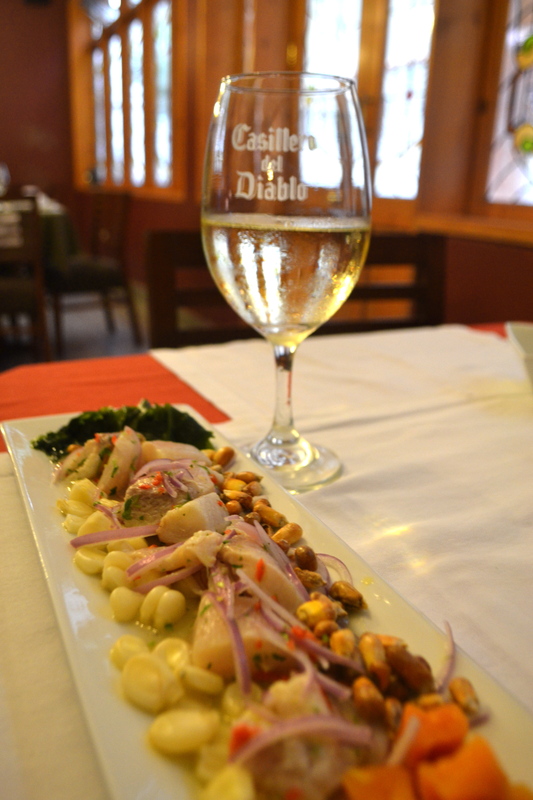 You must not leave Lima without tasting its signature dish, ceviche. 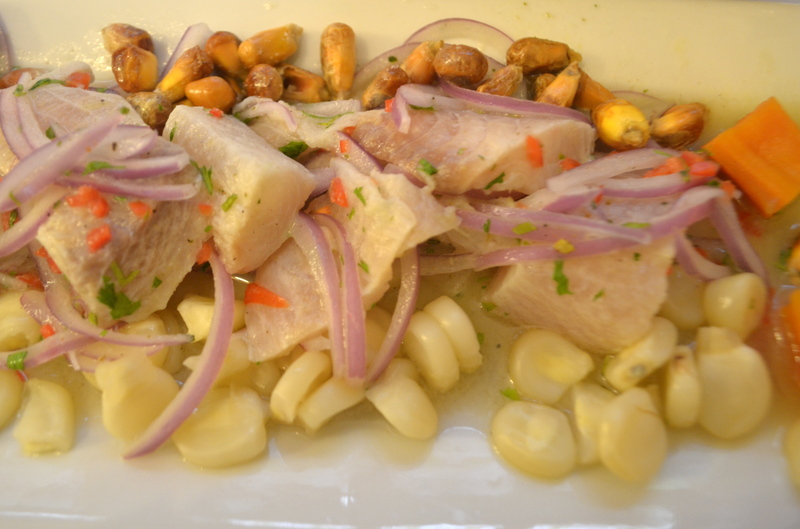 Ceviche is a tangy plate of raw fish marinated in lime juice and ajíes, or hot chili peppers. 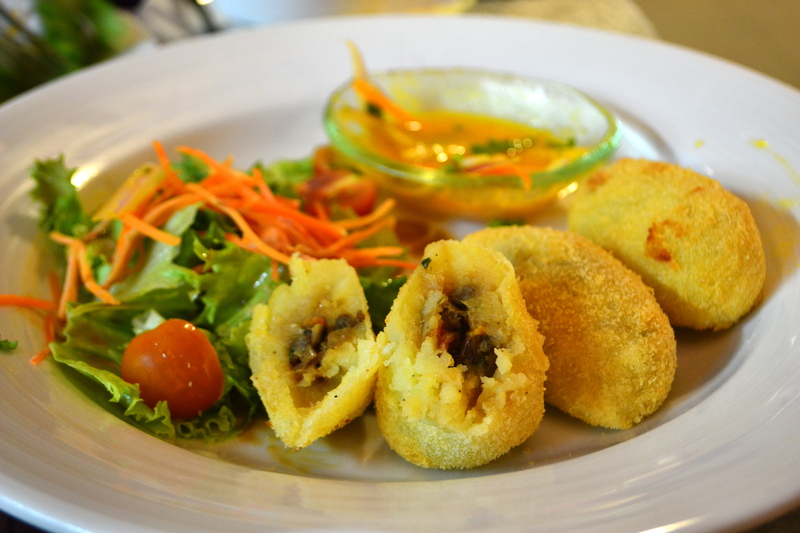 The mouth-watering dish is the star of Peru’s culinary repertoire. Limeños crowd lunch-only neighborhood holes-in-the-wall (cevicherías) for their ceviche fix and the best can be found in Miraflores. 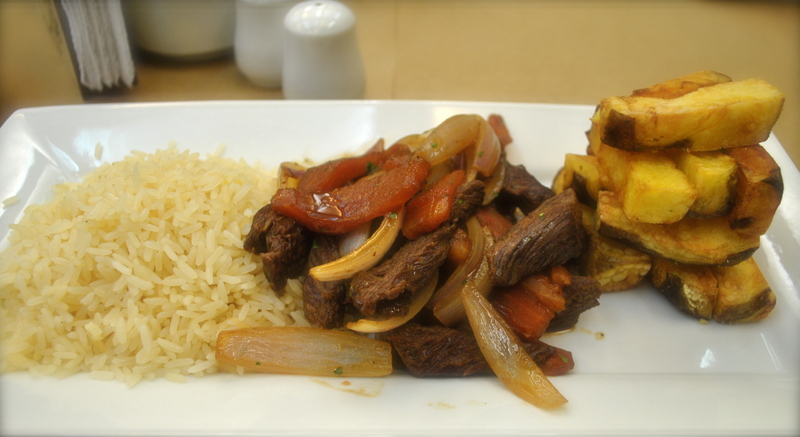 An appetizing ‘lomo saltado’ (sauteed beef tenderloin) is one of the most typical dishes of Peruvian creole food. It is prepared with chunks of beef tenderloin marinated in vinegar, soy sauce, peppers and other spices. 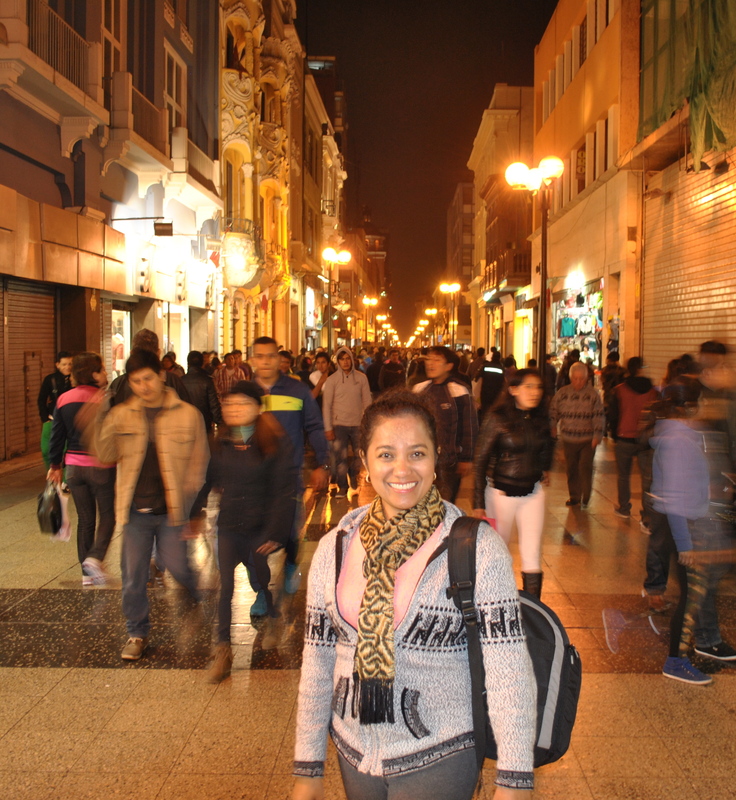 Lima’s cultural marriages – a mix of Spanish, African, Chinese and Japanese – is reflected in its culinary fusion. 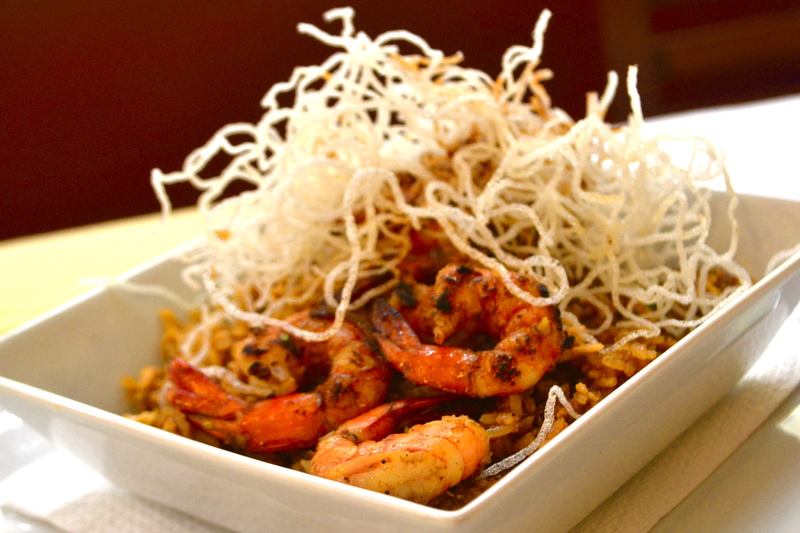 Limeño cuisine encompasses spicy creole dishes, Nikkei (2nd-generation Japanese), and chifa (a Peruvian twist on Chinese). The long Pacific coast is notable less for its beaches than the endless bounty of fresh seafood that makes it to markets and restaurant tables. 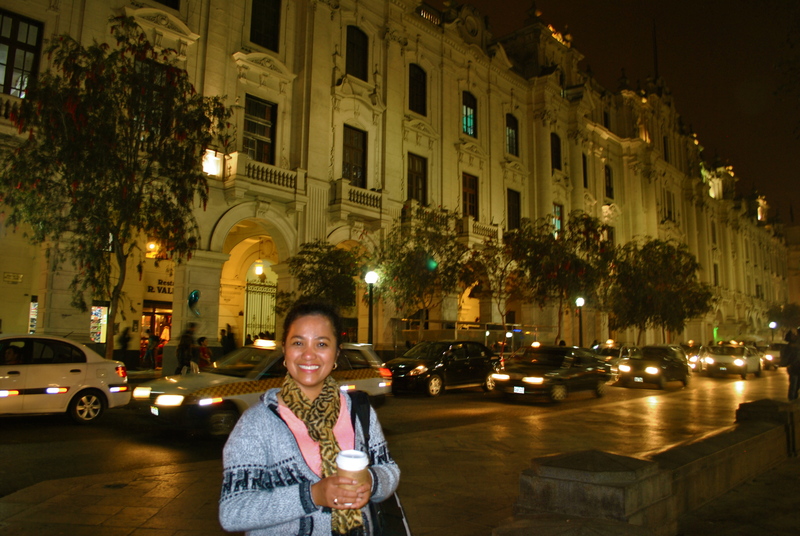 Lastly, like Peruvian coffee, Lima was flavorful. I have to taste it to prove it. 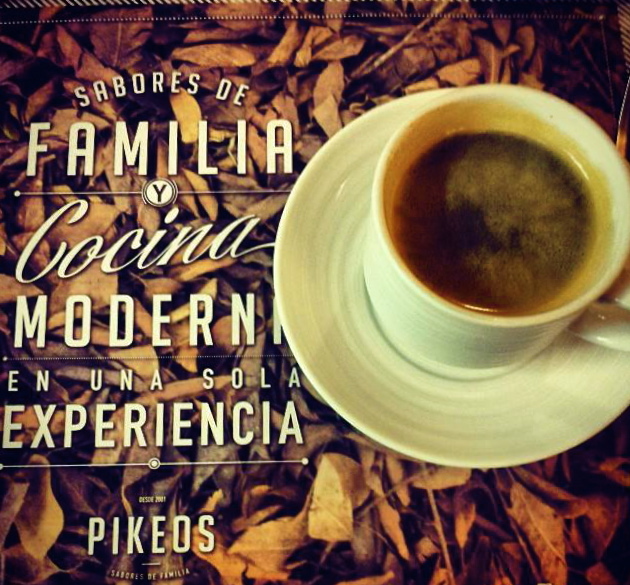 Its aroma, acidity and body play in harmony so that no one element predominates at the expense of another. It’s a city shrouded in history, gloriously messy and full of aesthetic delights. Thank God we did not miss it!